The people began to cry out to the LORD in their oppression. God called forth Deborah as prophet and judge over Israel. She arose inspiring warriors without weapons to fight. Deborah’s voice became a tremor that shock her nation to stand! Though most of the judges were acknowledged following a major victory, Deborah was an exception. She was a valiant and powerful leader prior to any military exploit. The bible and history show how God raises up a woman during revival or crisis. When a woman leads, it is birthing time – time for a new generation, a new move, or a new thing. Women are designed to produce seed, carry it to maturity and then bring it forth. Men contribute to the process, but only women birth! She senses movement! She perceives time! Israel was desperate! City streets were unsafe, let alone the country roads. Because they had forsaken God, He turned them over to their Canaanite enemies. It took twenty years, but Israel began to cry out to the LORD. They didn’t repent; nor did they seek mercy. They cried for relief from oppression. We are born naked but with gifts. God has entrusted each of us with natural and spiritual gifts necessary to fulfill His purposes. Deborah busily exercised her gifts of prophecy and wisdom living up to her name, meaning “bee”. Breaking through stereotypes, she arose as political and spiritual leader over Israel. Often, it is in difficult times that ones’ true nature is revealed. When the queen bee starts moving, warriors become activated responding to her instincts. “Wake up, Deborah, wake up! Out of apathy and complacency Deborah arose prophetically speaking God’s word over her nation. God’s voice through Deborah pierced the atmosphere, gaining her recognition as a righteous judge. Lappidoth means “torches or flames.” A wife first, she honoured her powerhouse husband. They were equals! Deborah was a prophetic torch over her nation; her husband was also a man of fire. A strong husband releases and opens doors for his wife to serve God wholeheartedly. Whether male or female, it is imperative that we honour leadership staying under the spiritual cover they provide. Godly leaders will always build, advance, and promote others whether in our homes, churches or workplace. Deborah’s position took courage and strength. Standing against the wickedness of her nation, she challenging Israel to godliness. Displaying faithfulness and wisdom, she received honour and respect from all. The day came! Something was shifting! She declared the word of victory to Barak, the military leader. Women arise! Wake up and step into God’s purpose! In your rising, inspire and elevate men as leaders and warriors. God is calling our men to stand and fight. Deborah’s daughters will always speak God’s word of victory into men. We know little about Barak. Some would call him weak; I think he was wise. Barak means “lightning”! Lightning is different from a “flame” or a “bee” but extremely powerful. 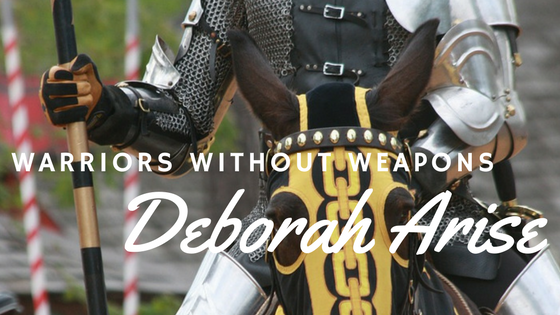 Deborah’s word from God was so powerful that 10,000 warriors without weapons gathered to engage a vicious enemy! “If God is for us, who can be against us?” It takes a man of audacious faith and courage to head out into battle without a weapon in hand! Israel had one weapon! The word of the LORD, through Deborah! Deborah neither pinpointed Barak’s response as weakness, nor did she ridicule, nag, command or manipulate. Deborah prophesied that the glory of victory would be shared with woman – accolades Barak was willing to share. Together they became a fearless force drawing from each other’s strengths. This is the day! It is birthing time! She convinced Barak to fix his eyes on the LORD. Victory would come through God’s intervention alone. Barak needed only to muster his small army of 10,000 foot soldiers and obey. The Canaanite came like a flood, 900 chariots strong. But God! God had a flood of His own! the earth trembled, and the cloudy skies poured down rain. The mountains quaked in the presence of the LORD…. Flash flood and overflowing river? Chariots immobilized! Deborah partnered with Barak on the battlefield; then they sing the only recorded biblical duet. Deborah was already known for her songs of worship; Barak joined her triumphant chorus. As a godly leader, she built up her team, commending the brave and inspiring them to further greatness. Deborah’s anointed leadership brought forty years of peace for Israel. Together, Deborah and Barak present a profound illustration of the synergy available when men and women work together. They demonstrate the essence of honour, bridging genders and uniting spiritual, political and military strength. Arise! Wake up and step into your anointing! Lock arms in victory! Together we will be undefeated in Christ, and when we do revival may just be around the corner…. But there is one more piece! Without it victory will never be complete! Do it Again Lord! Renew! Restore! Revive! If you would like to leave a comment or join the email list turn here!